The Daylesford Sunday Market operates each Sunday from 8.00 am to 3.00pm (winds down from 1:30pm, earlier if weather is poor) at Daylesford Station (rain, hail, shine or snow). A wide variety of stalls selling everything from books to spare parts for the car, fresh local produce, clothing and collectables are located at the market. 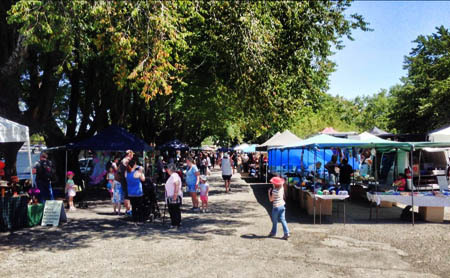 The Daylesford Sunday Market is located at 18 Raglan Street (Midland Highway) and plenty of FREE car parking is available. Dogs on a leash are welcome at the Daylesford Sunday Market. If you have something to sell and would like to attend our Sunday Market, please pre-book a stall or arrive before 6:30am on Sunday morning to queue for a stall site. Please note that we will not accept any non-local (50km radius) produce stalls. Food stalls are very limited and new applications will be added to a waiting list. Candle and sock stalls are also limited, stall bookings will only be accepted if regulars are absent. $130 regular monthly fee (Must already be a regular to qualify). For stallholders keen on attending the Sunday Market, please click here to download the information pack.